Elaine Davis believes the young man on the left with the wonderful wave in his hair is Harry H. Strauch,* son of Anton and Katherine Strauch. Harry was a senior in 1909 and graduated Valedictorian from Thomson High School. Elaine has a professional photo of him about the time he received his Ph.D. in 1916 from the University of Chicago. (In the photo he still has that light hair with the big wave and long straight nose.) As fighting intensified at the beginning of WW I Harry volunteered for the pilot training program, Army Signal Corps (no air force existed til WW II). He flew out of various air bases in France, and he was shot down on Sept. 18, 1918. His sister said after the war his remains were re-interred from the Argonne Military Cemetery to the Lower York Cemetery near Thomson, not far from the family farm. There is a marker there. Elaine believes this photo is Harry, but no one in that family is living, nor any relatives that might be able to positively identify the photo. Harry died unmarried, without descendants. Perhaps this possible name might spark some memory for someone else in the Thomson area. Patience pays off - Footnote has some years of the Thomson Review digitized and searchable. The following is a transcription and contains a list of the first string Thompson Basketball team, at least for the year Bert Grim played and including Harry Strauch. So I was right that it is Harry in the photo. With this charming article, perhaps some of the other faces in the photo can be identified. Thanks. The tragic death of Bert Grim, Mt. Carroll auto mechanic, on Saturday afternoon, when he was electrocuted by a short circuit in an ordinary voltage extension cord, has its lesson for all of us. For while shocks have been received from light cords and other and other electrical appliances, it shows that after all the results can be extremely serious in certain cases. Safety and precaution at all times is a good policy. A new light cord or a wooden creeper instead of a metal one might account for his being alive today. We place no blame on anyone, it looks to us just like an ordinary accident that might occur under hundreds of everyday working conditions. We are might sorry it happened, for to us Bert Grim was not an auto mechanic or a lad interested in photography. He was a basketball star, and to tell that story we will have to turn back the clock a good many years. Twenty-two or 23 years to be exact. About the time we graduated from knee pants and the 8^th grade at Thomson, basketball was just making its appearance and some of the �big� fellows in the high school rigged up a court on the sand lot outdoors adjacent to the school building. Of course, none of them had suits to lay in, so some old fashioned knee length track suits of plain white were secured. A basket ball was secured in some manner and every noon us kids had to get off the court while the high school boys practiced. There were only enough boys in high school to make a team. Bert Grim was the favorite basket thrower. Merle Griswold, now of Savanna, was center; Harold Livingstone, railway man of Montana; Ambrose Alleman, now of California; Harry Strauch who lost his life in World War, member of the Air Corps; Dee St. Ores and Otto Switzer, farmers of Thomson made up the balance of the team, with the latter two being the 1st string subs. 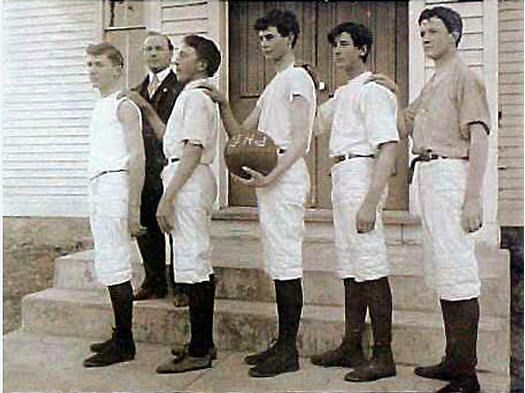 Bert was the special attraction of the team because he mastered a trick way to make free throws which was by throwing the ball with his right hand around behind his back and to the basket. Then again we remember that when winter time came when basket ball was played in a store building fitted up with a stove and 2 baskets, that it was Bert who soon mastered the trick of bouncing the ball off the low ceiling so that it came own through the basket for points, and somehow or another there was a small boy leaning on the upright that supported the opponent�s basket, who managed to jiggle it just a trifle when the out of town team tried the same trick which caused the all to roll around the hoop and miss point. We remember, plain as though yesterday, the chairs from the house placed around the court for the first game with an out of town high school team. The girls all dressed up in their white dresses with ruffles and frills, with their hair braided so nicely. There were some new songs to sing and all in all it was the gala day of the school year. Bert that day was a star too. He made many fine shots for points, in a much different manner than now and received the cheers and ovations of all. We suppose that every person interested in sports has their idols, and Bert was one of ours. Even in late years, when we would meet him in Mt. Carroll, the picture of him as a basketball player stood out more vividly in our mind than business work he was pursuing.